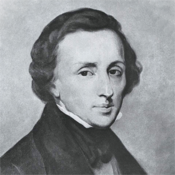 Fryderyk Franciszek Chopin (22 February or 1 March 1810 – 17 October 1849) was a Polish composer and virtuoso pianist. He is considered one of the great masters of Romantic music and has been called "the poet of the piano". Chopin was born in Żelazowa Wola, a village in the Duchy of Warsaw. His mother was Polish, and his father was a French immigrant to Poland. A renowned child-prodigy pianist and composer, Chopin grew up in Warsaw and completed his musical education there. Following the Russian suppression of the Polish November 1830 Uprising, he settled in Paris as part of the Great Emigration and never returned to his homeland. From 1837 to 1847 he carried on a relationship with the French writer Amantine Dupin, Baroness Dudevant, who wrote under the male pseudonym "George Sand". For most of his life, Chopin suffered from poor health, he died in Paris in 1849 at the age of 39. The vast majority of Chopin's works are for solo piano, though he also wrote two piano concertos, a fewchamber pieces and some songs to Polish texts. His piano works are often technically demanding, with an emphasis on nuance and expressive depth. Chopin invented the instrumental ballade and made major innovations to the piano sonata, mazurka, waltz, nocturne, polonaise, étude, impromptu, scherzoand prélude.